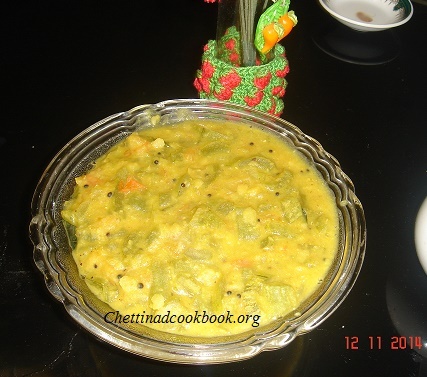 Koottu is mild flavoured recipe,not spicy or tangy,less aqueous than sambar.In chettinad region kootu is made by boiling dal and vegetable separately add sambar powder,salt, ghee and season with cumin seeds, and curry leaves added in, that’s it. This can be made with all vegetables and any dal. Good to feed children and for ladies after delivery, liked by all age and suitable dish can have with rice or roti.Here in this recipe,we grind some ingredients to add more flavour to it, said to be poricha koottu. Boil dal for 2 whistle keep aside. Cut Snake gourd in to thin small slices,boil with turmeric powder and Salt to soft. Grind the above “To grind” ingredients to smooth paste. Add altogether allow it to boil for few minutes. Temper with above”To temper”ingredients,add curry leaves and chopped tomato if preferred.